When I was 23 and cooking in my first restaurant in New York I quietly decided that I would open my own restaurant by 30. I was 31 when I opened my place Smallwares. I look back three years later and know that I slightly rushed the decision because of my own personal deadline and fear of never taking that risk. Since I have started this venture I have been successful in many ways, more then I ever imagined. I also have struggled more than I expected because I took on so much in a naive way. I have always been a cook, so all the other aspects of the business were new to me. Fortunately, I don’t fear stress; it actually motivates me. I am a last minute, at the buzzer, get-it-done type of gal. When you are in the restaurant industry, life is humming around you at all times. I work hard, I play hard, and I get up and do it again tomorrow. When I am the first one in the restaurant in the morning, it’s so quiet and tranquil, and I have a brief second of feeling like I have complete control of the day. That tiny moment is all I need though, everything can combust after that and I will get through it. Besides cooking, the first half of my day could be spent unclogging a toilet, planning private dinners, handling all the financial aspects of the restaurant, meetings, wine tastings and a million other things. At 4:50pm everyday it’s time to gather the staff, taste the new dishes and beverages and go over service notes, and the second half of my day starts. Through all this chaos though, I get to be creative everyday. I get to discover what produce is seasonally coming and going at any time, or what new ingredient or meal I have eaten recently that has inspired me. 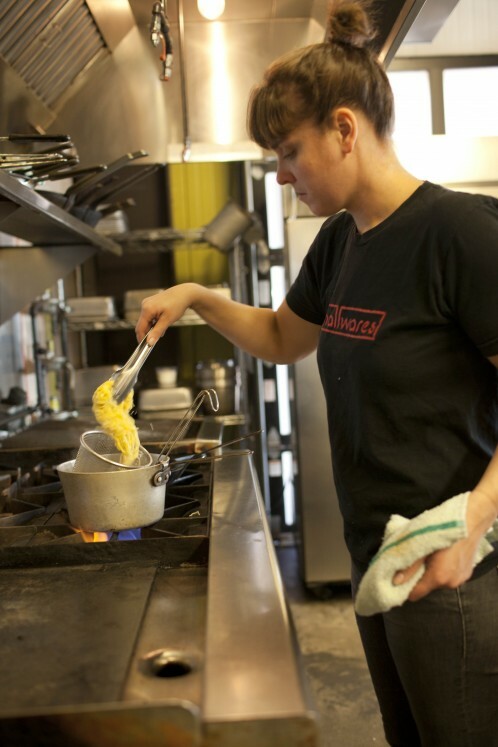 I bounce ideas off my staff, and we cook and taste and tweak until a dish is menu-ready. That’s the heart of what I do and what inspires and motivates me everyday. I don’t take much time off, and I usually spend my day off driving all over Portland shopping at small ethnic markets for ingredients that I can’t get delivered to Smallwares. 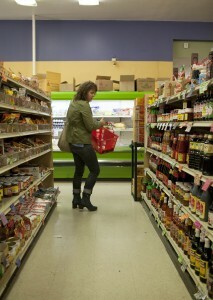 There is a small Thai store that I go to a couple times a week. They always have loud melodic music playing, and there is this sort of flurry of commotion between customers and deliveries. It transfers me to another place for a moment. Being at a market in Thailand feels so tangible for that second it encourages my creativity. It’s getting colder now and the growing season for produce slows down dramatically in Portland. I have to change the way I think about building a dish. Honestly I am less inspired by winter vegetables like parsnips or pumpkins than I am with a lush summer ripe tomato. Every year I can feel the chill coming. I automatically get frustrated, and then I realize it challenges me to think outside my normal perimeters. It’s the time of year where we gravitate toward things that we preserved throughout the year. Right now, we are using an olive oil we infused with doug fir tips in the spring, vinegar made by fermenting pineapple rinds, miso pickled eggplant from the summer. The last few years have been the most challenging time in my career, but when an idea starts to stir inside my head and I can’t wait to get into the kitchen… It’s worth it.